Campbell Posture Cane Reviews - Is it a Scam or Legit? The Campbell Posture Cane claims to combine a revolutionary ABS plastic handle that takes pressure off your shoulder and wrist, with a standup stability tip that delivers 360 degrees of traction, as well as 12 different height adjustments for a custom fit between 37” and 46”. Together, they advertise it can support the strength of your body, thereby helping you walk upright with less pain, improving your posture, and changing your line of sight from down to forward. You’ll also be able to easily get up from chairs and remain more balanced, safe, secure, and comfortable when you walk, they say, giving you the ability to navigate hills, sidewalks, stairs, and uneven terrain. And with its lightweight, sturdy aluminum construction, they advertise it’s easy to carry with you. If you’re experiencing regular lower body pain or mobility issues that aren’t addressed by traditional models, the commercial makes it seem like Campbell Posture Cane’s height and unique handle design could deliver results. But, is it worth the time and effort to give it a try, or are there other avenues you should explore first? As with most of our articles, we’ll start building a foundation of knowledge by covering the basics. How Do Devices Like the Campbell Posture Cane Work? In layman’s terms, this simply references a combination of mechanical engineering principals and biological knowledge used to help improve peoples’ lives. Specifically related to canes, they’re ‘biomechanically engineered’ to assist individuals with gait instability, since they’re designed to withstand an individual's entire weight and remain comfortable. To accomplish these tasks, Brett Sears, PT tells us that the bend of a properly fit cane (where your hand rests), should sit at the upper part of the thigh muscle where it meets the lower portion of the hip bone. Ideally, the arm holding the cane (the one on the opposite side of your injury) should be bent at about a 20-degree angle. Because of their weight-bearing differences, Sara M. Bradley, MD, FACP, and Cameron R. Hernandez, MD, further explain in an article on the American Academy of Family Physicians website that, “Walking sticks are probably more beneficial for higher-functioning patients who are interested in the exercise benefit of walking.” We’ll expand on some of these ideas shortly. 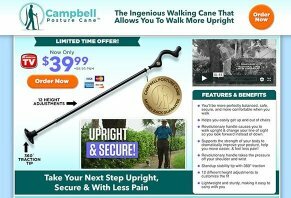 How Much Does the Campbell Posture Cane Cost & Where Can You Buy? During our research, we also found the assistive device sold on third-party websites like WiseAndWell.com and HarrietCarter.com for about the same price. All orders placed directly from Plymouth Direct come with a 30-day money back guarantee, less S&H. You can request one by calling 800-340-3418 or sending an email to customerservice@plymouthdirect.com. Third-party refund details may differ. All orders placed on the Plymouth Direct website are bound by an arbitration clause. In essence, this means that if you have a grievance with the company, you’ll have to solve it through binding third-party arbitration, versus the traditional court system (such as a trial by jury or class action lawsuit). What Are Customers Saying in Their Reviews About Campbell Posture Cane? We encountered two customer reviews for the Campbell Posture Cane on WiseAndWell.com, both of whom gave it a five-star rating. Each cited improved balance, reduced pain, and better alignment and posture, with no complaints. The bottom line is that if you're experiencing instability issues and need to improve your mobility safely, traditional canes really do work. As but one example, according to a 2014 study published in the journal The Gerontologist, of the 262 participants over the age of 60 involved, 75% who fell weren’t using their canes at the time. But, if you are part of the sizeable population who experiences arthritis or another type of chronic pain in your upper extremities, using a cane can, indeed, be a less-than-stellar experience. The good news is that there are a few steps you can take to which option will deliver maximum value, while simultaneously helping you minimize pain, posture, and line-of-sight concerns. Functionally, Dr. Chris Ho, a Hong Kong-based chiropractor and physiotherapist, explains that traditional canes and walking/trekking poles and staffs like Campbell Posture Cane serve the same foundational purpose: to provide users with extra support. The difference, though, is in the level of support they offered. When it comes to walking poles, Dr. Ho tells us that “the fulcrum created by the stick allows the upper body, especially the arms, to share the pressure on the lower body while walking, which keeps the body in balance.” This makes them “ideal for hikers and people whose legs differ in power,” he recommends. If you’re among the latter, the most critical aspect of minimizing pain when using a traditional cane is ensuring that it fits properly. As we mentioned earlier, this means the handle should come to the lower part of your hip bone; arm bent at about 20 degrees. Most modern aluminum canes are height adjustable, so you should be able to accomplish this on your own. But, Laura Inverarity, DO, emphasizes that if you encounter any confusion during the process, make sure you reach out to a local physical therapist for assistance. Also, “be sure you speak with your doctor or physical therapist before changing or altering your walking cane or other assistive device, just to be sure you are using the right device for your condition,” she says. Since the grip—which isn’t size adjustable in most models, Campbell Posture Cane included—is the only part of your body that makes direct contact with the cane, selecting the right one based on your needs and preferences is almost equally as important as height when it comes to minimizing pain. The Mayo Clinic recommends foam grips that conform to the shape of your hand. “If you have trouble grasping with your fingers — because of arthritis or other joint pains — you might prefer a larger grip,” they recommend. Here, again, is where a physical therapist’s professional feedback can help you maximize value. Where does all of this leave you when it comes to the Campbell Posture Cane? Based on what we learned earlier from physical therapists, doctors, and professional organizations like the American Academy of Family Physicians, walking staffs and poles like Campbell Posture Cane will likely provide the most value for those who require mild support and balance assistance when walking. If this matches your physician’s diagnosis, and you typically experience pain in your upper extremities when using traditional canes, it seems like their taller designs and unique handles might be a good fit. Just keep in mind that it might take some trial and error before finding an option that meets your unique combination of needs and preferences since there are many different models available. These include popular search results like HurryCane Freedom ($39.95), SteadyCane ($50), and Trusty Cane ($19.99). On the other hand, if you have gait instability, poor balance, poor eyesight, or certain chronic diseases, professionals don’t typically recommend walking poles as a viable option, whether they feature a Campbell Handle or not. Together, it appears the manufacturer’s claims that the Campbell Posture Cane will help you remain more balanced, safe, secure, and comfortable when you walk, is primarily dependent on your unique circumstances. Pro tip: Outside of its handle and height, if you’re looking to add similar self-standing functionality to your existing cane, keep in mind there are dozens of aftermarket tips and bases available online, often for less than $15. If your doctor gives you the green light, it’s positive that Plymouth Direct stands behind Campbell Posture Cane with a 30-day satisfaction guarantee. This way, if you decide to give it a try during your trial-and-error process, you won’t lose more than initial and return shipping. Just keep in mind that this could cumulatively exceed $15 (depending on your proximity to the East Coast), so it’s not an entirely risk-free transaction. Took approximately six weeks to arrive as they didn’t have enough product to meet orders. One week later I called about the handle becoming loose repeatedly. Was told I could send it back for replacement but no offer for return postage or re-ship charges. Also, the tip is too large. I’m constantly stepping on it and losing my balance. Not worth the $48 charge including shipping. Don’t waste your time or money! By the time you pay S&H, the $39.99 cane is closer to $50. It took forever to get here and I had to call twice to track my order. The Customer Service at Campbell Cane was about the worst I have ever experienced. After a month, they still wouldn't say if my order had shipped or not, only that it had been "released." What does that mean? Their CS person, Jordon Johnson, sounded like he was on drugs. A few days later, my credit card was charged, along with two bogus charges that turned out to be fraud. Co-incidence? I think not. My father likes the cane, so I am giving it two stars for him. However, it is NOT sturdy. A good wind will knock it over when it's standing. All in all, very disappointed with this company, their product, and their customer service. I just received my cane from Collections Etc. It was very easy to put together. Just screw the handle into the cane. Adjusting the height was easy too. My cane has only 10 holes for adjustment which is fine for me. I am 5'3" tall. I thought there was only one version of the cane. Actually there are two. The original has 1 2 holes for height adjustment and there is also one with only 10 holes. At 5'3" I have it adjusted to the highest position. If you are much taller, you will need the cane with 1 2 holes. Just be aware of the difference. Look's like a good idea right? If you have trashed knees like me, the whole reason for a cane is so you can keep from putting weight on your knees. Bone on bone for me. This cane is a joke. I ordered the Campbell Cane it seems months ago but never received it. I saw the withdrawal from my card on banking account. Unable to contact anyone at their company to speak to customer service. I don't have an order number, just the information from my account. Unhappy, not relieved by product. I purchased this cane on January 27th and still have not received it. I have emailed them twice and no reply. Very unhappy and feel that I was taken for my money. I am a disabled veteran. This is the best cane ever. I love how it helps your posture. Regular canes have you bending over which caused me back pain. This did not and was a blessing. I have had several friends try my cane and are going to order their own. This does not give you the same support as a cane. In the advertisement, every picture they show of a person bending over with a cane is because the cane is NOT adjusted to the proper height. This is just another fancy walking stick, that’s hard to put in your car. I contacted Plymouth Direct, they sell this cane. I was told it could take as long as three months or more to get this product, this info should have been on their website when I placed the order. I will be contacting my state attorney general. Write a Review for Campbell Posture Cane!